Dream Pod 9: Venus Kickstarter Final 48 Hours - Stretch Goal 06 Updated! The Jovian Wars Venus Forces Kickstarter is now entering its final 48 hours. The Kickstarter ends on Sunday Night December 2nd, 2018 at 8 pm EST. As of this update pledges are at $6,659.00 CAD with 5 Stretch Goals Unlocked. We really want to get extra parts added to all 8 of the new Venus spaceships using the Stretch Goals so that players have more options when building the ships. So we have Updated Stretch Goal 06 at $7,000.00 CAD pledged, adding parts from planned later Stretch Goals to it. 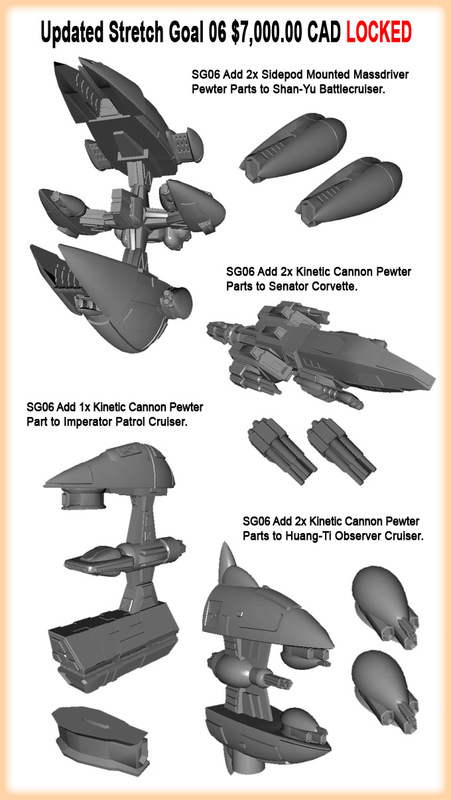 Stretch Goal 06 now adds 2x Sidepod Mounted Massdrive Pewter Parts to the Shan-Yu Battlecruiser, 2x Kinetic Cannon Pewter Parts to the Senator Corvette, 1x Kinetic Cannon Pewter Part to the Imperator Patrol Cruiser, and 2x Kinetic Cannon Pewter Parts to the Huang-Ti Observer Cruiser, see the Updated SG 06 graphic below. We just need $341.00 CAD more in pledges over then next 48 hours to reach $7,000 CAD and unlock SG 06 and add all those great option parts to the ships for our Amazing Backers. Checkout the Venus Forces Kickstarter at the link below and make a pledge for some great sci-fi spaceship minis. Home › Blogs › Robert Dubois's blog › Venus Kickstarter Final 48 Hours - Stretch Goal 06 Updated!